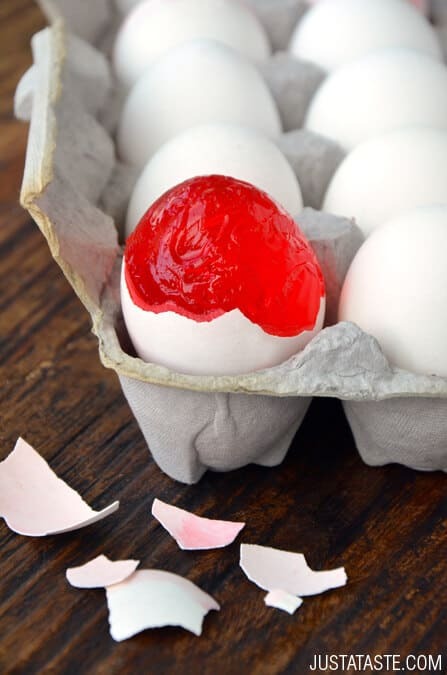 I will admit that this edible craft takes a bit of skill and patience, but the effort is well worth it once you catch someone cracking an egg into a hot skillet and ending up with scrambled Jell-O. And who can beat the presentation of a brightly colored treat served in a stark white shell? I first fell in love with using eggs as serving containers when I made Thomas Keller’s iconic Truffled Egg Custards during one of the final modules of culinary school. 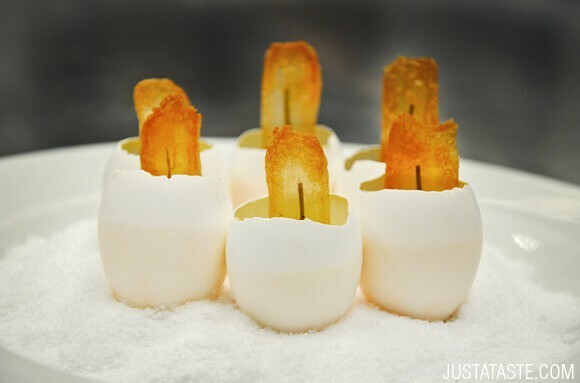 The end result features a creamy custard served inside hollowed out egg shells garnished with paper-thin potato-chive chips. My apologies to Chef Keller, but I took your custard down a notch and replaced it with … Jell-O. But Chef Keller wasn’t the only inspiration for this faux treat, as you may remember the Spanish food blog La Receta de la Felicidad’s egg-shaped brownies that took the food blogosphere by storm last December. Thomas Keller + Spanish food blogs + my love of dessert = Jell-O eggs. And that right there, my friends, is a perfect window into how my brain works. Scary, right? 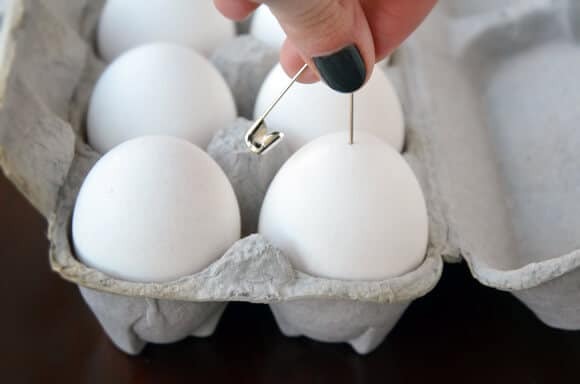 Begin by using the push-pin to puncture two small holes in opposite ends of one egg. 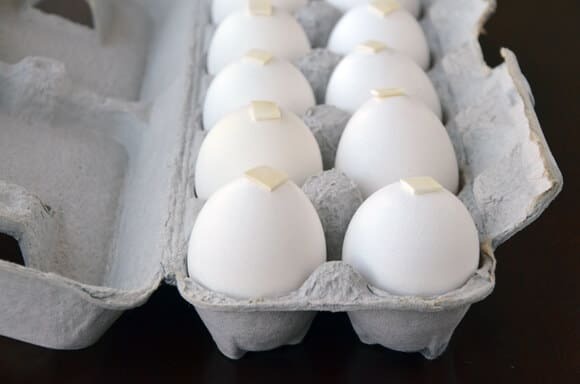 Blow the egg whites and yolks out of the egg (you may have to increase the size of the hole on one end), and then thoroughly wash it out with hot water or boil the shells. 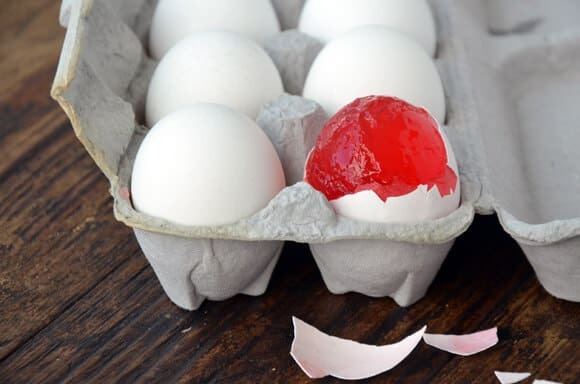 Keep in mind that eggs can carry salmonella, so the hotter the water and the stronger the pressure, the better. Once clean, firmly fix a piece of duct tape (or any other incredibly strong tape) over one of the holes. Place the egg, tape-side down, back into the carton and repeat the hollowing out process with the remaining eggs. Prepare the Jell-O according to package instructions and then insert the pastry tip into the top hole of the hollowed out eggs and pour in the Jell-O until the egg is full. 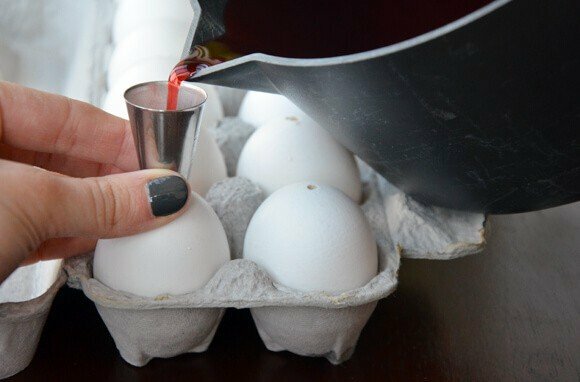 The Jell-O will be hot, so pour carefully and slowly to ensure the eggs don’t overflow. 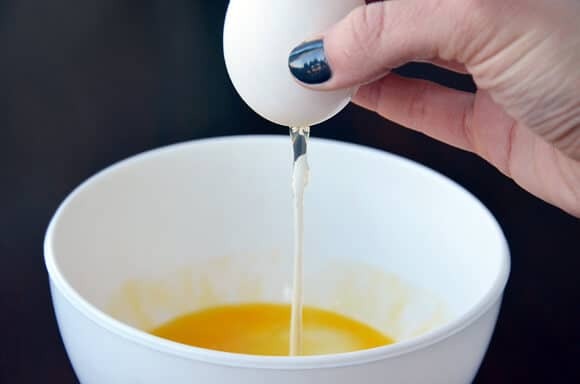 Transfer the carton of eggs to the fridge and chill them until the Jell-O has fully set, at least three hours. Once firm, crack off the shells and enjoy!